Dominique has been featured in news articles, magazine interviews, television, and reviews. Find a selection below. Dominique had the wonderful experience of being interviewed by the great team at Voyage Houston. "Meet Dominique Røyem of Fort Bend Symphony Orchestra"
Dominique was named one of Houston's Top 100 Creatives by the Houston Press in 2014. "100 Creatives 2014: Dominique Royem, Symphony Orchestra Conductor"
Read the the article HERE. Dominique was featured in Outsmart Magazine in 2013. "In those years, women have come a long way, baby; in fact, the conductor of The Pajama Game’s orchestra of twenty-two professional musicians is another female Montrose resident, maestro Dominique Røyem." Dominique was featured in the Houston Chronicle in 2013. "Working with Røyem is especially gratifying at the Heinen Theatre, where the stage is so deep that BCCM can set the full, 22-piece professional orchestra onstage." Dominique was featured in the Houston Chronicle, Fort Bend Sun Edition, when her appointment as FBSO's Music Director was announced. "Røyem said, "FBSO is a vibrant arts organization that is creating wonderful concerts for everyone. I am excited to serve them as music director as we continue to make great art." Dominique was featured in D. L. Groover's Houston Press review of the musical Promises, Promises. "...Maestro Dominique Røyem and her finely tuned orchestra... "
Dominique was featured in D. L. Groover's Houston Press review of the musical Bells are Ringing. "The orchestra, under maestro Dominique Røyem, breezes through Styne's original orchestrations with verve and bounce. Count them, 23 musicians! Sweet saxes and clarinets, lush strings, a full complement of brass, ten strings! The sound is full and rich, no tinny synthesizers here. " Dominique was featured in Everett Evan's Houston Chronicle review of the musical Bells are Ringing. "Dominique Royem's expert conducting is a key asset, bringing the right snap and spirit to Styne's music." 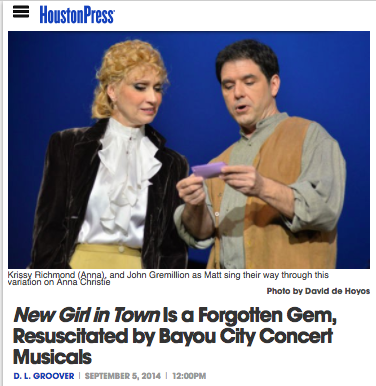 Dominique was featured in D. L. Groover's Houston Press review of the musical New Girl in Town. "Under the musical direction of maestro Dominique Røyem, the BCCM orchestra practically purrs through those lush orchestrations from Broadway masters Robert Russell Bennett and Philip J. Lang. " 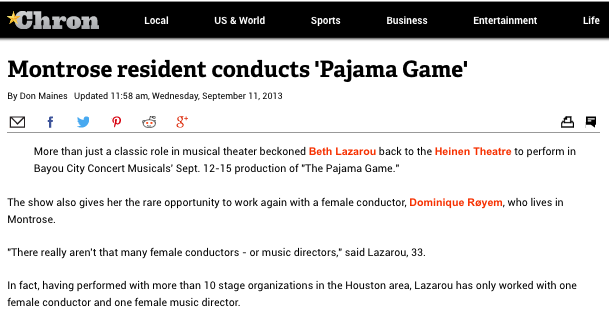 Dominique was featured in Everett Evan's Houston Chronicle review of the musical The Pajama Game. "The orchestra, led by Dominique Røyem, performs the score with loving care as well as expertise." Dominique was featured in D. L. Groover's Houston Press review of the musical The Pajama Game. "A special word of thanks goes to... conductor Dominique Røyem, and the BCCM Orchestra, whose sweet and lowdown music-making is one of the evening's highlights. The saxes are particularly honey-like. " Dominique was featured in Buzz Belmont's Houston Chronicle review of the musical One Touch of Venus, by Kurt Weil. "Conducting by Maestro Dr. Dominique Røyem is superb, setting just the right tempos and moods to Weill’s marvelous score." 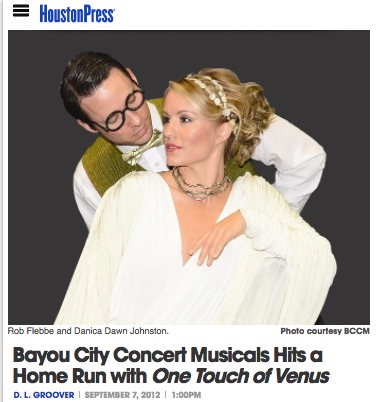 Dominique was featured in Everett Evan's Houston Chronicle review of the musical One Touch of Venus, by Kurt Weil. "Dominique Røyem conducts with style and feeling... the orchestral performance is strong." Dominique was featured in David Clarke's Broadway World review of the musical One Touch of Venus, by Kurt Weil. "Dominique Royem masterfully conducts the wondrous orchestra. She and her musicians intrigue the audience with grace, poise, and professional perfection." "The 18-piece orchestra -- yes, 18-piece! -- under maestro Dominique Røyem swings up a storm. " Dominique was featured in Everett Evan's Houston Chronicle review of the musical Dirty Rotten Scoundrels.
" The orchestra gives a spirited reading of the score under conductor Dominique Royem." Dominique was featured in David Bow Bentley's Houston Chronicle review of the musical Dirty Rotten Scoundrels. "Dominique Røyem conducted the fine orchestra." 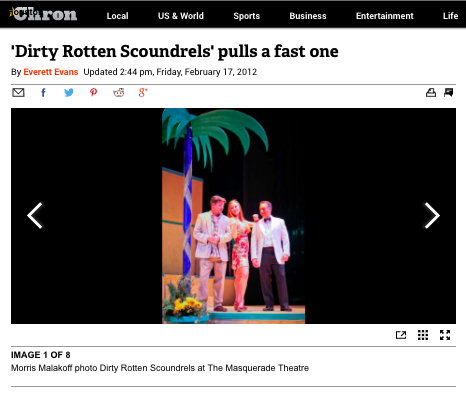 Dominique was featured in Buzz Bellmont's Houston Chronicle review of the musical Dirty Rotten Scoundrels. "Maestro Dominique Røyem steadfastly and sprightly conducts the excellent eight-instrument orchestra." Dominique was featured in D. L. Groover's Houston Press review of the musical Dirty Rotten Scoundrels. "... always does the right thing, as do maestro Dominique Røyem and her intrepid octet of an orchestra. " Dominique was featured in D. L. Groover's Houston Press review of the musical Finian's Rainbow. "... Maestro Dominique Røyem and the nimble cast make us totally believe in magic. " Dominique was featured in Everett Evans's Houston Chronicle review of the musical My Fair Lady. "Dominique Royem conducts with spirit." 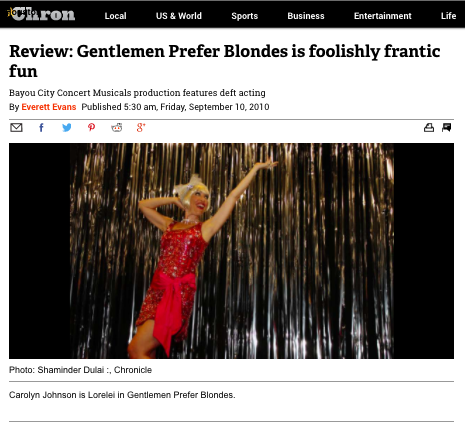 Dominique was featured in Everett Evans's Houston Chronicle review of the musical Gentlemen Prefer Blondes. "Under conductor Dominique Royem, the orchestra plays with zest and style." Dominique was featured in Buzz Bellmont's Houston Chronicle review of the musical Gentlemen Prefer Bondes. "The Gentlemen Prefer Blondes Orchestra Conductor Dominique Royem is joy to watch on the podium. Her energy and passion is boundless, her tempos are perfection, and the sumptuous sounds she elicits from Jule Styne’s brilliantly orchestrated score and her superiorly talented musicians is magnificent." Dominique was featured in D. L. Groover's Houston Press review of the musical Gentlemen Prefer Blondes. "With ... maestro Dominique Royem's bouncy tempos... what more could gentlemen, or ladies, prefer? " In her first review, Dominique was featured in Everett Evans's Houston Chronicle review of the musical Pal Joey. "Conductor Dominique Røyem and her musicians treated the Richard Rodgers-Lorenz Hart score with silken grace in the romantic turns, bouncy spirit in the rhythm numbers." Dominique was featured in D. L. Groover's Houston Press review of the musical Pal Joey. "BCCM's concert version... [with] the liveliest of big band orchestras led by Dominique Røyem, will be hard to beat. It certainly will be hard to forget." Dominique was mentioned in D. L. Groover's Houston Press review of the musical On the Town. "As is usual with Bayou City Concert Musicals, the performers and backstage talent gave their all, brilliantly, and it's better to just list them: ... conductor (Dominique Røyem)." 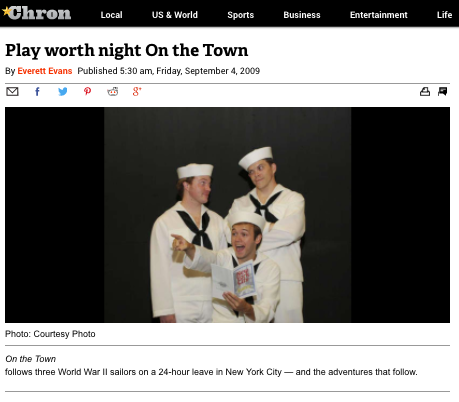 Dominique was featured in Everett Evans's Houston Chronicle preview of the musical On the Town, by Leonard Bernstein. "Our conductor, Dominique Royem, came out of rehearsal the other night, reeling: ‘Do you know how exhausting this is to conduct?' she said. ‘It's like the love child of Shostakovich and Stravinsky.'"